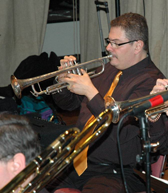 Steve is an outstanding Trumpet Jazz Soloist who began playing in grade school and after a family member, who worked in Las Vegas in the 70’s sent him an autographed Doc Severinsen album, he knew he wanted to play the trumpet. He honed his talent in the “school of hard knocks”, playing initially with any group that would give him the opportunity and eventually was able to work with and tour with many varied celebrity groups and famous names like Frankie Avalon, Bobby Rydell, Ray Charles, Linda Ronstadt, Frankie Valli, Lou Christie, Gloria Gaynor, Joan Rivers, Regis Philbin, The Tommy Dorsey Orchestra with Buddy Morrow, The Jimmy Dorsey Orchestra, Jerry Vale, Al Martino, Buddy Greco, Jimmy Roselli and Tony Bennett to name a few. Steve’s greatest musical accomplishment was leading a twenty-one piece orchestra for Connie Francis for several years. In addition to working with the Full Count Big Band, Steve currently tours internationally with Little Anthony and the Imperials, The Temptations and The Four Tops.